alaTest has collected and analyzed 70 reviews of Canon VIXIA HF S200. The average rating for this product is 4.5/5, compared to an average rating of 4.0/5 for other Camcorders for all reviews. People are impressed by the size and portability. The price and image quality also get good feedback, but many are critical about the viewfinder. There are some mixed opinions about the reliability. We analyzed user and expert ratings, product age and more factors. 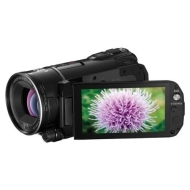 Compared to other Camcorders the Canon VIXIA HF S200 is awarded an overall alaScore™ of 81/100 = Very good quality. alaTest has collected and analyzed 66 user reviews of Canon VIXIA HF S200 from Amazon.com. The average user rating for this product is 4.5/5, compared to an average user rating of 3.9/5 for other Camcorders on Amazon.com. People are impressed by the size and portability. The price and image quality also get good feedback, whereas there are some mixed opinions about the reliability. Some have doubts about the viewfinder. Canon HFS200: Pricey but worth it! We are so excited to have our Canon Vixia HF200 digital camera to document our first kid. Canon's VIXIA HF S200 flash memory camcorder, with two SD memory card slots, offers Canon's most sophisticated feature set to date - blurring the line between consumer and professional. Canon's superlative proprietary imaging technologies help deliver video and 8.0-megapixel photos with incredible detail and lifelike color. Touch and track allows you to achieve sharp focus and precise exposure for any subject, simply by touching the generous 3.5" high resolution (922,000 dot) touch panel LCD. Native 24p mode perfectly matches the frame rate of film. And 5.1-channel surround sound ensures your audio complements the stunning realism of your video. Optical Sensor Size:1/2.6 / 1/2.6"